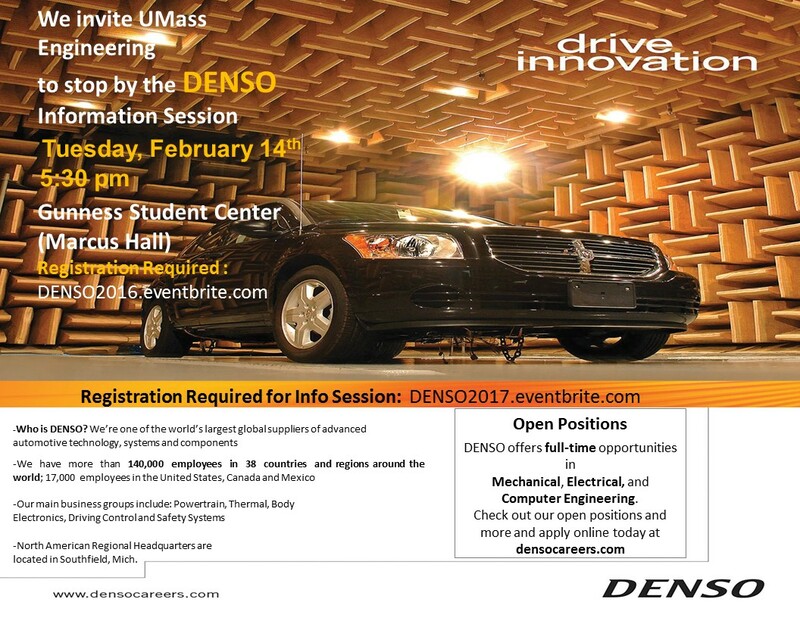 DENSO invites the UMass SuperMileage Vehicle Team to come meet our team! Also, seniors with a strong interest in working in automotive engineering, pursing a degree in ME, EE, CSE and a GPA of at least 3.0, are welcomed! Come connect with one of the world’s largest global suppliers of advanced automotive technology, systems and components, and learn about our Powertrain, Thermal, Body Electronics, Driving Control and Safety Systems. DENSO has multiple fulltime opportunities at their North American Regional Headquarters in Michigan. Resumes welcomed! Food is provided.